New Members – Our membership class for adults is offered twice a year (one in spring the other in fall). This informal gathering is to allow new people to meet each other, to tour the building and get an overview The United Methodist Church beginnings, of our ministry and to allow members to share the vision and mission of MUMC. If you are interested, simply attend the session. Those who have completed membership class will be received into membership during regular Sunday services. Baptisms are done after consultation with the person desiring to be baptized or with the parents (if that person is a child). Please contact the pastor to set up a time that is convenient. Please be aware that baptisms are scheduled in conjunction with the church worship schedule so not all worship dates may be available. Membership is the result of an individual’s profession of faith in God, the Father Almighty; maker of heaven and earth; in Jesus Christ his only Son, and in the Holy Spirit. It is important to note that you do not need to be a member to participate in church activities and events! The process leading up to making a public profession of faith varies from church to church. At MUMC, anyone interested in joining the church is to attend our Membership Class. Individuals are received into the church either by profession of faith or transfer of membership. Profession of faith describes those who are coming into the church without any previous history in Christian faith. Transfer of membership recognizes that an individual that was active in another Christian denomination or church has chosen to change that affiliation to this church. Are there levels of membership? The United Methodist Church does not have “levels” of membership but some distinctions are made for statistical purposes. Full members are those adults (and youth who are confirmed) who publicly profess their faith before the congregation (or transfer membership into the church). Two seldom used categories are Affiliate membership and Associate membership. Both are generally usually used by college students, military personnel or seasonal residents when they wish to be active in a local church due to a temporary relocation. I am on the church mailing list. Does that mean I am a member? Not necessarily. It means that at some point, you participated in a church activity and we collected your mailing information. If you have not made a public profession of faith in Jesus Christ before the congregation, you are considered a constituent rather than a member. You may check your membership status by calling the church office. How is baptism related to church membership? In United Methodism, baptism is a Sacrament that reminds us of God’s grace that is at work in the life of every human being. Anyone who wishes to become a member of a United Methodist Church MUST be baptized. We believe that baptism, as a sacrament of initiation into the life of the church, is a one-time event that does not need to be repeated if performed in a Christian denomination. Can I have my child baptized in the church if I am not a member? The United Methodist Church practices infant baptism. Adult baptism is for adults who have never been baptized as an infant and are seeking membership in MUMC(we do not ‘re-baptize’). At MUMC, it is expected that one or both parents, even if not members of the church, will be active in the life of the church. Baptism places the child and parents, as well as the congregation, in a covenant relationship with God. Therefore, a child’s parents are expected to profess their faith in Jesus and promise to raise their child in the knowledge and love of God until that time when the child can profess his/her faith before the church. This assumes that the parents will be active in the church so that they can fulfill these vows to the best of their ability. The congregation also affirms its commitment to the family to help provide a community where the child and parents are nurtured in the Christian faith. 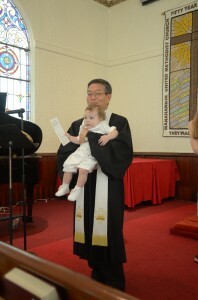 The pastor alone has the authority for who may be baptized. Once again, because baptism is a community act and celebration, this is normally discouraged. Under some extenuating circumstances, the pastor may agree to such a request. Can my membership be changed or terminated? Yes, membership in the local church can be changed at the member’s request or by Church Conference action. Generally, membership is terminated by death, by transfer to another church, withdrawal at the member’s request, or by removal by the Church Conference due to the member’s failure to uphold the membership vows. What is the process for Charge Conference removal? Because church membership recognizes the covenantal nature of our relationship with God and with others, we profess our faith in God and promise to uphold the church by our prayers, presence, gifts and service. In other words, we promise to pray for the church, faithfully attend corporate worship and other opportunities to grow in discipleship, and to support the church both financially and with their abilities. An individual is considered an “inactive” member when he/she has not fulfilled these vows by neither attending worship nor making a financial contribution for a year. After this year, the member’s name is presented to the Charge Conference for two consecutive years. If, in the space of that two year period, the person does not attend worship or make a financial contribution, he/she may be removed from the membership roll by the Church Conference action. Will I be notified of my membership status? It is our practice to annually inform inactive members by letter that we consider you to be inactive but that also invites you to join us again in worship. This list is determined by our Membership Committee. Generally, a member is not notified of the final Church Conference action. Can I rejoin the church if I am removed from membership? Yes. The pastor may ask you to attend membership class again or can simply reinstate you in the membership rolls.